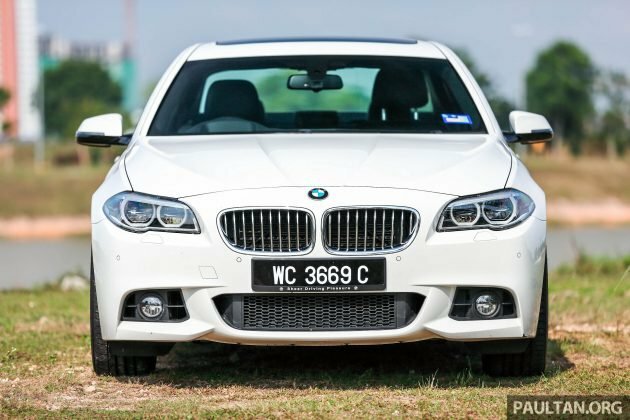 We had the opportunity to try out the recently refreshed F10 BMW 528i over the Raya holidays earlier this month. When we say refreshed, it’s in both specs and price – both were updated back in March this year. The 528i you see here gained a larger set of 19 inch Style 351M alloy wheels, a boot lid spoiler, a sunroof and an updated iDrive system with BMW’s ConnectedDrive with Concierge Service. At the same time, its price tag was slashed from well over RM417,800 down to RM378,800, thanks to qualifying for EEV incentives for locally assembled cars in Malaysia. It’s been over six years since the F10 5 Series was first introduced to the world and the facelift model you see here only received minor updates during its mid-cycle update, with only minor revisions to the bumper, headlamps and tail lamps. Plus points for us – the way the F10 wafts along with near air suspension like refinement in Comfort+ mode thanks to its adaptive dampers yet retains the ability to offer a sporty drive with the switch of a button, and the perfect way the engine matches the eight-speed ZF transmission. Negatives – despite all the updates and EEV pricing, there’s still no reverse camera, and the interior is starting to look a bit dated now in a world where you have iPad-style screens in the car, both in newer BMWs as well as in competitor models. And of course, there’s the fact that the G30 5 Series is probably going to look and drive better both on the inside and out. But if you’re in the market for something in this segment right now, the F10 somehow still manages to stay high on the checklist to be considered. Just ask the dealer to retrofit a reverse camera! UPDATE: BMW is now offering a BMW 528i M Performance Edition, limited to 100 units retailing for RM363,800 OTR without insurance. It adds gloss black kidney grilles, a carbon fibre front splitter, black side skirts with M Performance badging and a carbon fibre bootlid spoiler. i honestly do not see the reason to have a reverse camera when the PDC system is more than enough. Also the iDrive screen is 10.2 inches! How big do you guys expect it to be?? I still find the NBT iDrive to be very impressive, especially when compared to mercedes comand and Audi MMI (i have only used the Audi A6 hybrid,not sure about the newer ones). Following your logic, no reason to want a luxury car when a Honda Civic is more than enough? Of course… civic is just a honda.. bmw and mercedes.. is way above honda in term of luxury.. Pity current owners who bought the 528i for RM420k. This is how BMW treats existing owners. Their prices drop drastically kononnya due to EEV and the 2nd hand market just sees RM60k wiped out overnight. BMW Malaysia should compensate all BMW 528i owners who bought this car the past 1 year..
Woah! First time Da Boss Man comes to take down bashers. U da man! in which part of my post that i imply that!? All I said was that the iDrive screen is 10.2″ which is bigger than some of the newer models. Also some people don’t like the screen sticking out, at least in the F10, the screen is integrated to dashboard. BTW I am not saying that the F10 is the best thing next to sliced bread, of course the newer E-class has a better interior, but I am not sure that command is better than iDrive. I was talking about design, not size. My initial comment was in reference to you saying reverse camera is unnecessary when there is PDC. To those who already have a F10, come join us on FB or even on our very active chat groups in Whats App (by invitation only). Just get in touch with us over in Facebook. Just search F10 Crew Malaysia. To those whom are still at the cliff and thinking if you should take the jump to buy a F10, you can post your questions on F10 on our FB page and we are sure to assist. Cheers! How frequently do we use our private swimming pools? If you were to build a new house, do you still want a swimming pool? Do you want to have 3 luxurious homes for personal use? It depends on what you like. An engaging drive or a luxurious one? No right or wrong. I guess many Malaysians prefer a plush interior at these prices. That has never been BMW ‘s forte. RM389k but the pedals are way offset to the right and not aligned with the steering and the seat. Your feet and legs are bent off to the right! I m just wondering, how does the BMW 528i M Performance Edition qualify for EEV status?? If I m not mistaken, one has to achieve above 20km/l to be considered EEV in Msia, No??? It’s G30. I expect it to look like a scaled down 7 series.